In 2010 we salvaged the entire Corbett House kitchen for a planned LEED home project. It was designed by John deKoven Hill. The 2501 Grandin Road house was House Beautiful’s 1960 Pace Setter and is considered the culmination of Frank Lloyd Wright and John deKoven Hill's collaborative designs. View slide show of the exterior of the home. We aren't going forward with that project so we are offering the kitchen for auction to benefit the Architectural Foundation of Cincinnati. Read more about the kitchen at the CITYBEAT article by Steven Rosen, "Saving a Modernist Cincinnati Kitchen." RENNOVATION NATION article, "Saving the 1960 all Formica kitchen from the Corbett House." The entire kitchen by John deKoven Hill was saved except for a refrigerator and two dishwashers that were not original. Here's a slide show of the kitchen removal day. All of the advanced NuTone appliances are included. The final date for the auction to end hasn't been set. 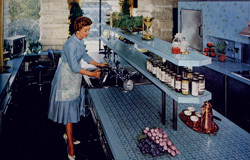 Image is from the Formica advertisement in the Feb. 1960 issue of HOUSE BEAUTIFUL, "A Formica Wishing Kitchen for pacesetters with 'high hopes.' When expense is no object and new ideas for 'Pacesetter' kitchens abound - nobody, but nobody can think of a more luxurious colorful carefree surfacing than Formica laminated plastic...." View slide show of that issue's Corbett kitchen pages. Contact us for more information 513-260-9025.